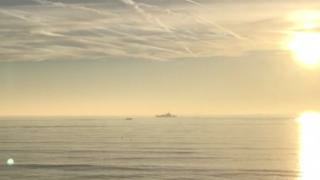 A search is under way after an empty dinghy was spotted drifting off the coast of Kent. An empty rigid-hulled inflatable boat (RHIB) was seen a couple of miles from Walmer and a number of lifejackets have also been seen near Shakespeare beach in Dover, some 15 miles (24km) away. Four lifeboats have been launched and the Coastguard helicopter scrambled. HM Coastguard said it is assisting Border Force officials. On 18 February, 34 people – including men, women and children – were brought to shore at Dover from a small boat discovered in the Channel. The Home Office is keen to point out that it’s dealing with what the Home Secretary, Sajid Javid, declared to be a major incident at the end of last year. It says the number of people attempting the perilous journey across the Channel by boat has decreased from about 250 in December to 90 last month. On the 18 February however, a boat carrying 34 people was intercepted off the coast of Dover. With unseasonably mild weather and calm seas, coastguards believe the number of crossings may increase again, despite repeated warnings that migrants are risking their lives in the world’s busiest shipping lane.